Derbyshire fought back with bat and then ball to seize the initiative on day three of their Division Two match against Leicestershire. They began the day up against it when they resumed on 199-6, 181 behind. Although Ben Raine claimed 5-66, Callum Parkinson (48 not out) and Tony Palladino (46) shared 73 for the last wicket as Derbyshire were 362 all out. 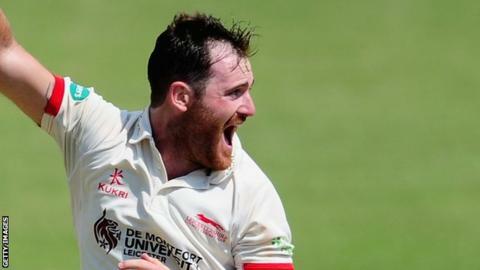 Leicestershire soon slumped to 30-3 but 49 from Mark Cosgrove helped them to 109-5 at the close, a lead of just 127. "We delivered a bit of a counter-punch today. We started by gritting in with the bat, wearing them down, and then we came in hard with the ball. "We knew there is still plenty in the wicket with the new ball and that if we took early wickets we could get ourselves in a good position to win the game, and that's what we've done. "We play cricket to win games, and of course it's been in our minds. It's a good wicket, really, it could do with a bit more pace in it, but if you see off the new ball you can score runs." "It's probably the best I've bowled all year, and I'm starting to find some good form with the ball in time for the last few games of the season. "They batted well this morning, they made us work hard to get them out, so credit to them for that. But it's a deteriorating pitch, the ball is starting to go up and down a bit - it's the sort of pitch the bowlers can control the scoreboard on, and anything around 200 or more wouldn't be an easy chase. "We still have some good batters, Ned Eckersley and Niall O'Brien are class, and we're not too worried yet. I can't see us settling for a draw at any point."